NOT blogging, NOT podcasting … because I have been sewing. Quilt top almost done; just need borders. Almost finished… my FOCUS POCUS quilt top is assemble but it just needs the borders added. I could kick myself cause I have set aside fabric strips to bring the pattern out into the border but I have looked high and low for the zip lock bag that had the fabric and it is GONE. So I have been re- thinking the border and will simplify it. Such a shame. I know I will find the bag once the borders are applied…. OH WELL…. Can’t win them all. I will post more pictures in the future when it is done. CURRENTLY .. The top is hanging on my drape rods that is why it is not hanging straight… is is straight. Just want to see how it looks so I can consider the borders. For the free motion quilting I am taking it to a long-armer and having a simple edge to edge leaves pattern quilted. 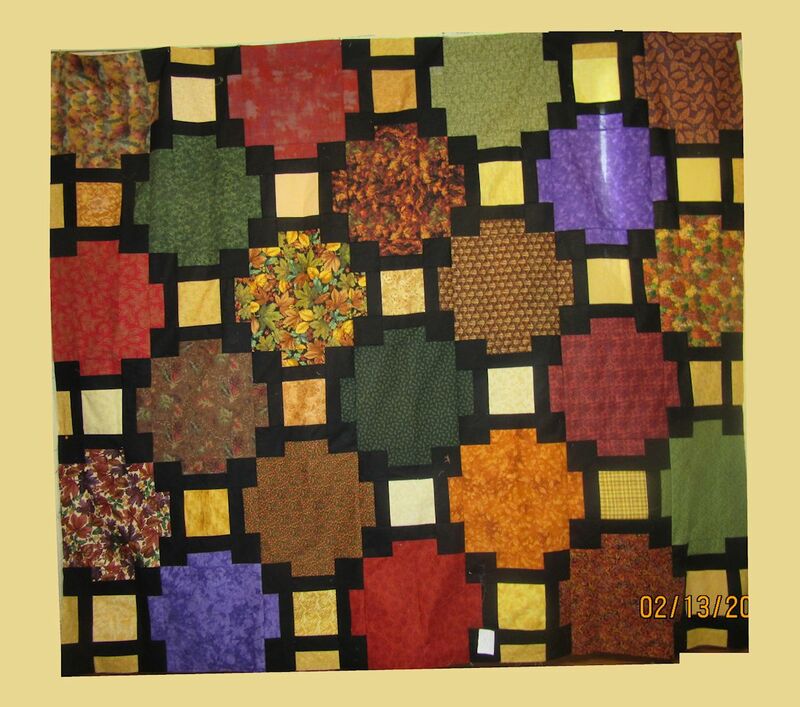 I will add some simple FMQ motifs after she has it adding names and dates to the quilt. I hope to give this to my niece … in the future. BTW … found and interesting article all quilters should read about the REAL COST OF MAKING A QUILT. Be sure to follow the links to the YOU TUBE VIDEOS from QUILTY they had interesting information. Speaking of QUILTY the magazine will no longer be published. It is such a shame since it had become one of the few magazines I made a point to purchase. I liked their quilts alot, but I think the thousand of quilt blogs have cut into the magazine publishing business with tutorials, and free articles. A quilter no longer needs to buy magazines to get patterns. WELL this is all for now. I am painting a bathroom this weekend and cleaning my bedroom as I am having a new mattress delivered tomorrow… Heaven forbid the delivery men see a messy bedroom.